Saturday's first game was held between last year's champion Water Design and their opponent Cherokee. Water Design started leading the game from the first seconds and took an easy win by the score of 141-58. Highlights included a beautiful reverse dunk and a left handed slam dunk by UMAD . The second game was very interesting, as last year's second place team EIG and Thestis competed (carlos team he is from USA ) They were tied at the end of the first quarter of the game but at the end of each quarter took a big 6 point lead. Thestis top scorer Carlos led his team with 20 points while Addis and Eskender added 20 and Eig simon and Ebrahim gave their best performances to dominate the game. City Oilers eased past Ethiopia's basketball Club Gondar City with a commanding victory that took the defending champions to the semifinals. The Oilers recorded a 98-52 comfortable win in a game that was played out at the MTN Indoor Arena in Lugogo. 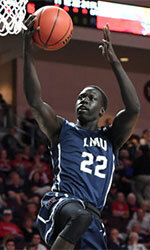 Landry Ndikumana (198-F-95) and James Okello (193-F-90) led the scoring charts with 14 points each. Leading from the start, Oilers were in driving seat with a 26-13, 55-18, 79-28 in the order of the first three quarters before cruising to a 46 point game victory. Jimmy Enabu (187-G-88) (12), Robinson Opong (11), Jordin Mayez (12) and Jonah Otim (193-G-94) (13) reached double figure points. Star players Stephen Omony (198-F-81) and Adarius Pegues were rested in preparation for the upcoming tougher semifinals. Mandy Juruni's side are now two wins away from defending their Zone Five Club Basketball crown, and the side will take on Kenya Ports Authority in the first Semifinal today. Kenya Ports Authority (KPA) didn't need the services of Desmond Owily as they eased past Gondar City with a 108-35 win in their opening game of the 2017 Zone V Club Championship in Kampala. The former UCU Canons center is yet to be cleared by FIBA but was barely missed as Ariel Okall, Ramadan Arou and the rest of KPA cruised. Gonder scored the first six points of the game but only added two to end the quarter with a meager 8 against KPA's 28. The second quarter was even worse for Gonder as they only managed only 3 points to trail 11-61 at half time. Former City Oilers' forward Arou scored a game high 18 points while Antony Matongolo and Okal had 17 and 15 points respectively. Arou registered a double-double with 10 rebounds to accompany the 18 points while Samuel Ochola picked 11 boards. For Gondar City, only Lionel Mena, with 10 points, clocked double figures on the score chart. Reat Tut had 2 points and 10 rebounds as Gondar were subjected to rough start by the Kenyan giants. Both Gondar and KPA will have to face Betway Power as they are pooled together in Group B.